Last week I made this tried and true Crockpot Chicken Tortilla Soup for our amazing teachers at Morgan's school. After getting a request for the recipe, I realized I needed to repost this must-have golden nugget. The original 2013 post is below. Enjoy! With the cold season upon us it's the perfect time to simmer soups and stews in your slow-cooker. 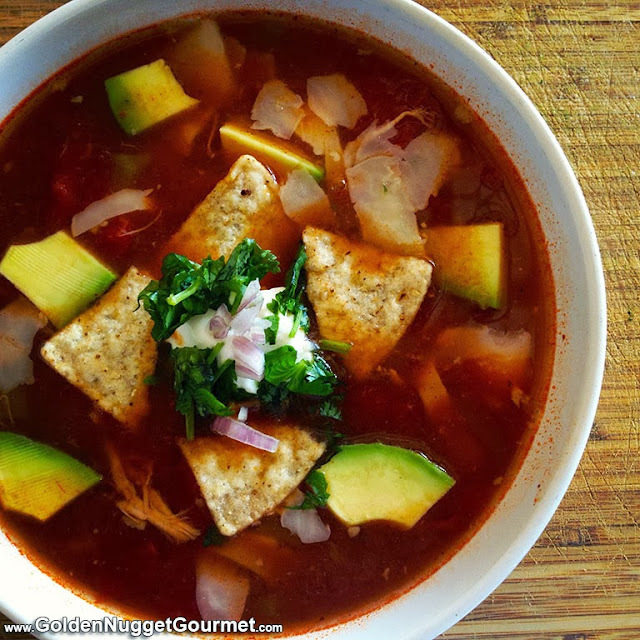 Last week I picked up a rotisserie chicken from Costco (you can't beat $4.99 for a whole chicken) and made this delicious Crockpot Chicken Tortilla Soup from Allrecipes. I had never had this type of soup before and quickly realized that I have been missing out. Don't forget a splash of lime juice right before serving as it sends the fresh flavor over the top! GNG Tip: I replaced the 2 cups water with chicken stock and added a can of black beans (drained). Also, after picking off all of the chicken I placed the carcass in another crockpot with ten cups of water, 2 celery stalks, a carrot, and onion to make homemade chicken stalk to freeze for future use.